Rescuers were called to reports of a grebe struggling at Crumbles Pond, Princes Park in Eastbourne just after 6pm last night (3rd April 2018). It was reportedly struggling to stay afloat and was waterlogged. East Sussex Wildlife Rescue & Ambulance Service’s Lead Casualty Manager Chris Riddington headed down from WRAS’s Hospital in Whitesmith, but due to the urgency also contacted rescuer Laura Carrick who lives in Eastbourne. Laura arrived and found the grebe who didn't look as bad as first feared. Chris then arrived and they both watched the grebes behaviour for a while which clearly showed something was just not right. Nets and poles were obtained from the ambulance and Chris and Laura attempted to catch the grebe who was playing hard to get. They were then joined by rescuers Amelia, Andrew and Charlotte who helped keep the bird down one end of the outlet channel. After a few attempts at capture the grebe was having none of it and swam off. With the outgoing tide the grebe was taken by surprise and began to be pulled towards the outlet which goes under the road out to the beach. Rescuers saw it struggling but couldn’t get to the poor bird before it disappeared behind the grill and under the road and beach. Fearing the worse rescuers were upset to hear her shouting in the tunnel being pulled out to sea. Chris went to the bank close to the metal grill and was relieved to see she wasn’t too far in but then realised she was struggling, trying to get back through. The Grebe had got her head stuck in the water caught up in litter and debris. Chris quickly jumped into the water and put his hand through the grill and managed to secure and free the poor bird. The Grebe was passed up to rescuers and then driven back to WRAS’s Casualty Centre. On arrival it was assessed and a puncture wound was found. She has also plucked a large amount of feathers causing her to be waterlogged and freezing cold. In addition to being quite underweight and some injuries to it's beak. 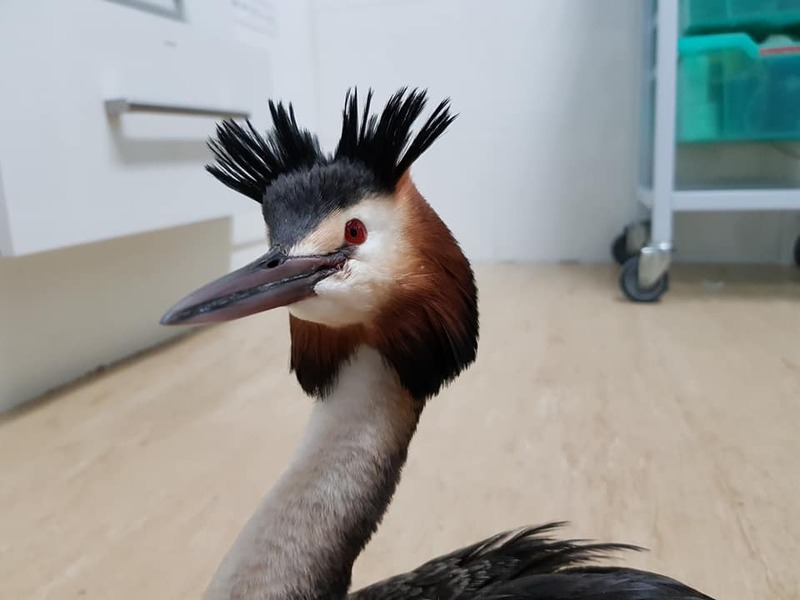 The bird stayed at WRAS’s Casualty Centre but is expected to be transported to the RSPCA Mallydams Wood Centre for the use of their specialist waterbird facilities.